Humans have long wondered if we are the only form of sentient life in the Universe. For decades, observations through efforts such as SETI have been ongoing in the search for extraterrestrial life (namely, extraterrestrial radio signals). However, these attempts have been frustrated by a lack of observational evidence and a great deal of uncertainty of what signs we should even be looking for, since our search is based on our own anthropocentric view of what extraterrestrial life should look like. As a result, a good portion of our search for extraterrestrial life has been centered around estimating the probability of detectable civilizations. The Drake equation has been long used for estimating the number of intelligent civilizations capable of radio communications that may be inhabiting our galaxy. This equation involves several variables, and while some variables are reasonably well constrained (ex. the rate of star formation in our galaxy), most are not and we are only able to make a guess for some of these (ex. the fraction of planets that may be able to support life, and the lifetime of intelligent, communicating civilizations that may develop). Since we only have a single data point (i.e. our own species) on which to base our estimates, this leads to tremendous sources of uncertainly and as a result, proposed estimates using the Drake equation are wildly discrepant over dozens of orders of magnitude. 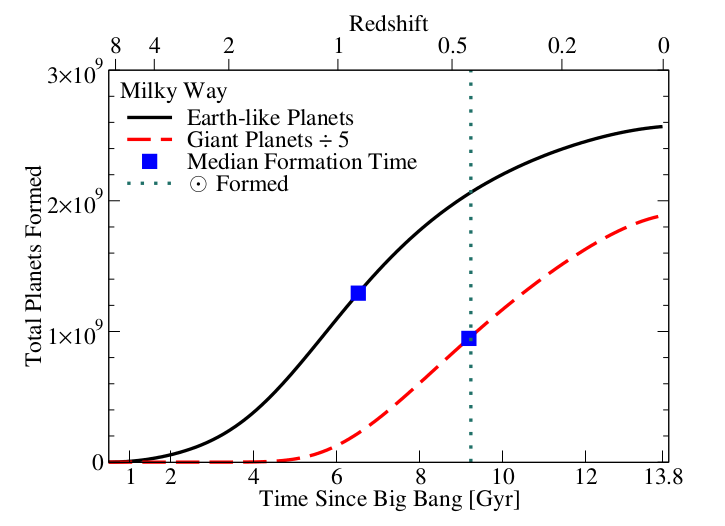 Instead of the Drake equation, the authors in this paper use observational constraints and theoretical simulations estimate the past and future history of planet formation (and from that, eventually estimate the number of potential civilizations in our Universe). This is done by combining galaxy star formation rates with planet formation rates of a star to estimate the number of planets that have formed in the past, and the number that will form in the future. Observationally, this is a viable approach as thousands of exoplanets have been detected by NASA’s Kepler mission, and our understanding of galaxy star formation rates are well constrained. Fig. 1 shows the resulting planet formation history for our Milky Way. Fig. 1: The total number of Earth-like planets and gas giant planets in the Universe, as a function of time since the Big Bang. The blue square indicates the median formation time of each type of planet. The vertical dotted line indicates the formation time of the Solar System, which occurs roughly after 80% of Earth-like planets had already formed and after 50% of all giant planets. 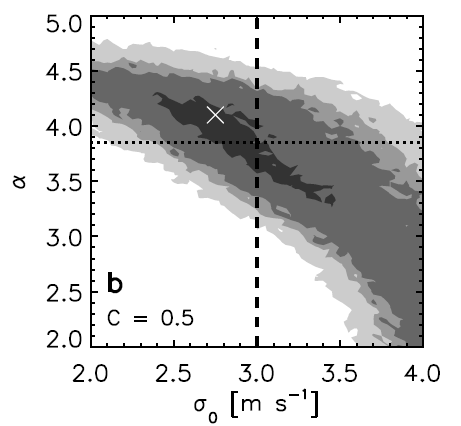 The Earth-like planet formation rates are directly proportional to galaxy star formation rates, so this quantity is constrained by the measuring the latter. The two types of planets form at different rates due to their different dependencies on stellar metallicity. 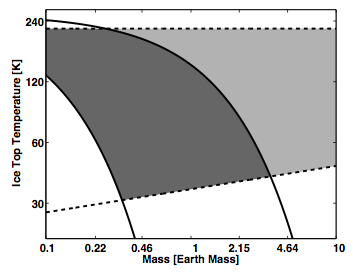 From this estimate of planet formation rates, the authors then use a Bayesian statistical method to constrain the number of intelligent civilizations in the Universe given the formation age of the Earth (see Fig. 2). The authors estimate that there may be 10^9 Earth-like planets and 10^10 giant planets in the Milky Way alone. Additionally, the authors predict that based on current star formation models, The Earth was formed before 92% of similarly sized planets have already been formed or that will form in the future. This suggests there is a fairly large chance that there may be other civilizations in the Universe other than our own. While the task of estimating the number of intelligent civilizations in our Universe is still subject to various uncertainties, these results offer hope that our search for extraterrestrial life may be not be completely unfounded. Fig. 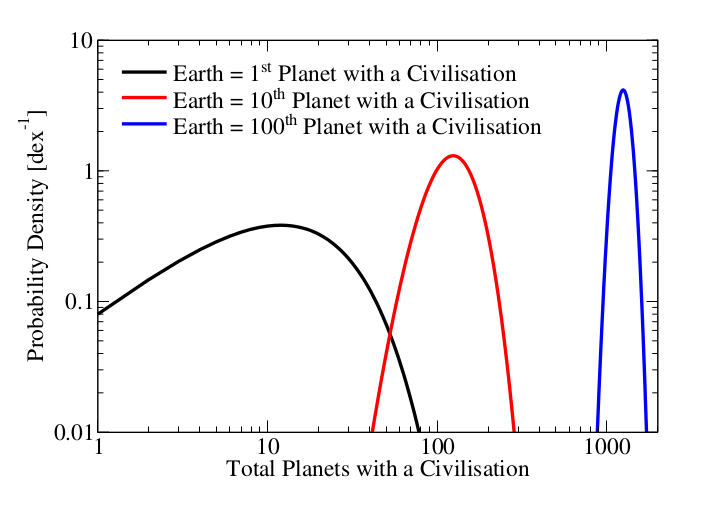 2: This plot shows the probability of there being a certain number of planets with civilizations in the Universe. Each curve represents this probability, with the condition that Earth is the 1st/10th/100th planet in the Universe with a civilization. If the Earth is *not* to the only planet in the Universe to have a civilization, then this drastically increases the probability that there are thousands of civilizations in the Universe. 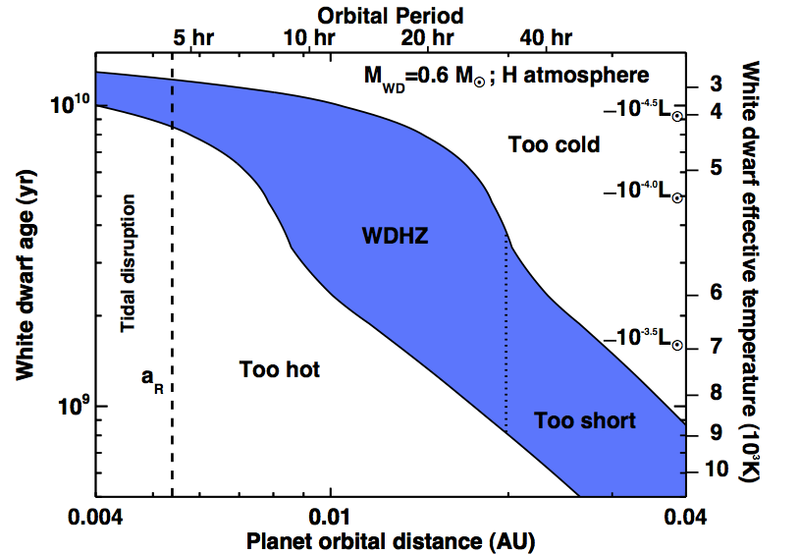 Life with a Lone Wolf: Habitable Planets in Interstellar Space Detecting Transiting Planets Around White Dwarfs The Kepler Exoplanet Census Super-Earths or Mini-Neptunes? Are supernovae included in the estimate. They create as well as destroy life.